Butterflies and zebras. And moonbeams and fairy tales. That’s all she ever thinks about. Riding with the wind. 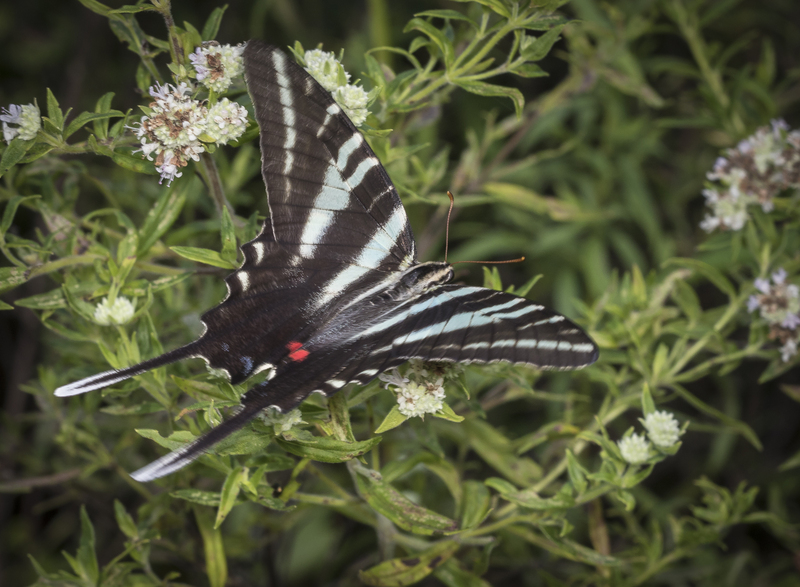 Zebra swallowtails (Eurytides marcellus) are surely one of North Carolina’s most beautiful butterflies. Their bold pattern of black and white stripes, long tails, and the bright red spots near the base of their hind wings never fail to delight me when I spy one flitting through the summer air. They are almost never found far from their host plants, pawpaw. The most I have ever seen were down at Pettigrew State Park and Pocosin Lakes National Wildlife Refuge, where pawpaw is the dominant tree in the understory. I have them occasionally at home (we have several pawpaw trees on our property) and have seen them frequently this summer at work. Last week was a particularly good one for spying these flitting beauties. I am working on a photo collection of the pollinators of the NC Botanical Garden and am trying to get out once a day for at least a few minutes to document the amazing abundance of species visiting our wildflowers. While stalking some wasps on a sunny afternoon after summer camp duty, a stunning butterfly zoomed by, quivering as it foraged on a couple of species of mountain mint (Pycnanthemum sp.) in the roadside Piedmont habitat. 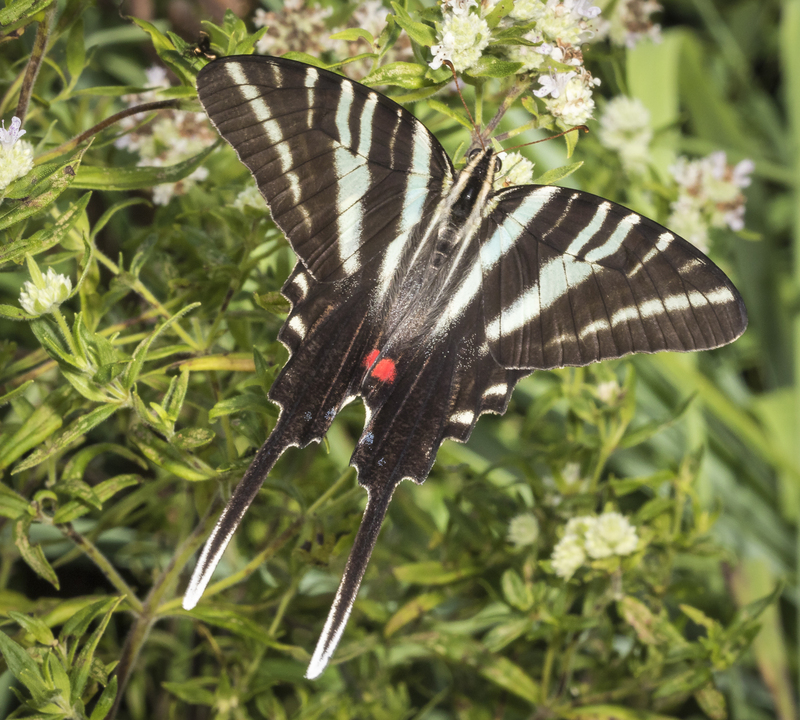 There is no mistaking a zebra swallowtail – a rapid flyer, with bold markings and long tails. This one was particularly gorgeous, and fast. The summer generation is larger, bolder in color and has longer tails than the early spring one and this beauty looked fresh. The tails seemed particularly long and the red spots on the hind wings especially bright. There was even a hint of blue in the stripes at certain angles. It was a challenge getting close enough to attempt a photo, and quickly became a frustration as the butterfly never sat still while flitting among the clusters of tiny mountain mint flowers. 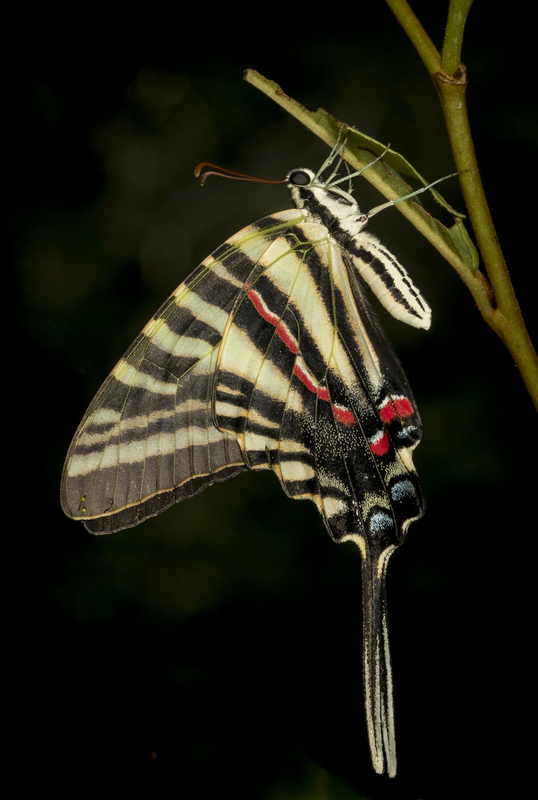 One reference said that these swallowtails have a shorter proboscis than most, and are therefore more often seen on small flowers than are other species of swallowtails. I managed a couple of in-focus (mostly) pics before I had to head back inside, but was wishing for another chance. On Friday, we explored the habitat gardens and, as happens on most walks, one of the campers hollered, “Mister Mike, come look at this”. I walked over and peered down into the grasses and saw a newly emerged zebra swallowtail climbing up to finish hardening off its wings. I gently let it climb onto my finger and placed it on a twig of a pawpaw sapling (most likely its dining hall as a larva). At last, a non-fluttering zebra swallowtail! I grabbed a few quick photos, and thanked our young camper for her sharp eyes and inquisitiveness. Hopefully, after a week of exploring the garden, they are all taking home the lesson of the value of planting native species and the rewards of observing the beautiful mysteries of the natural world.